Article first published as TV Review: THE ORVILLE on Seat42F. There have been rumors of a Galaxy Quest television show for years. I’d love to see that. But for now, the closest we’re going to get is THE ORVILLE, a new sci-fi dramedy coming to FOX. 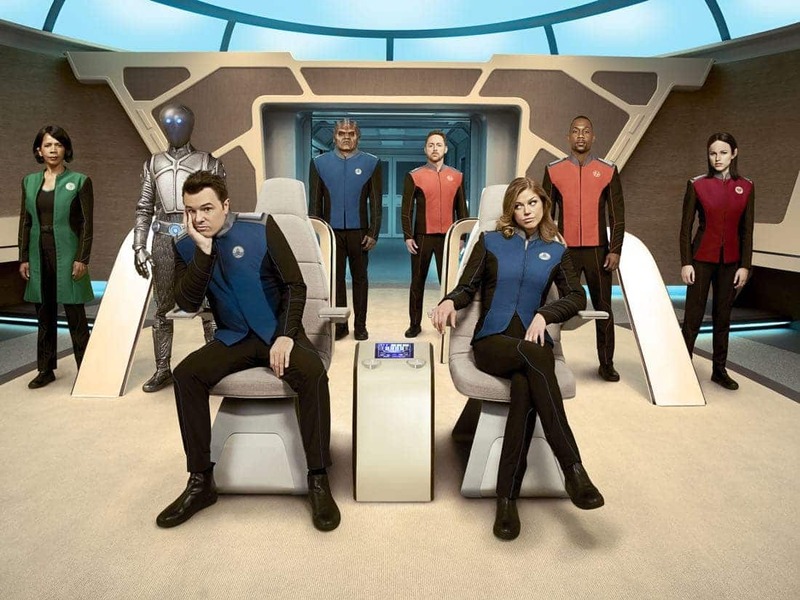 Though not exactly the same sense of humor as the beloved Galaxy Quest movie, THE ORVILLE does take the adventure and wonder of Star Trek, mix it with Seth MacFarlane’s trademark brand of humor, and keep it grounded and dramatic enough to actually build a cohesive story with characters you can invest in. It is no small feat to get such a thing right. As THE ORVILLE begins, as you likely have already heard, Ed Mercer (series creator Seth MacFarlane, Family Guy) has just been given his first command: the Orville. It’s not top-of-the-line or anything too fancy, but it’s a nice little sleek exploratory starship that will leave Earth and explore the galaxy. Ed gets to choose one crewman, his best friend Gordon Malloy (Scott Grimes, American Dad! ), but most of the compliment is already set. And the last addition, which he has no control over nor prior knowledge of, is his ex-wife, Kelly Grayson (Adrianne Palicki, Agents of S.H.I.E.L.D. ), who will serve as his XO. Kelly cheated on him, and Ed is predictably not eager to have her back. That in of itself is a humorous concept, but thankfully THE ORVILLE doesn’t go too far into sitcom territory with it. There is tension between the couple, yes, and that drives their interaction. Equal side-by-side seats on the bridge of the ship probably don’t help Ed feel any more in control. But their chemistry, while not entirely new, does seem fresh in the performances, and they seem to be a pair audiences will root to get back together. They could bicker just as effectively in a relationship, and there are clearly still feelings between them. Palicki and MacFarlane are great together. The diverse crew include a robot, Isaac (Mark Jackson), a member of a single-gender species, Bortus (Peter Macon, Shameless), and a young woman named Alara who is out to prove herself (Halston Sage, Neighbors). It is a solid mix of varied personalities, with several species represented, and while many of the actors are not well-known, they all handle themselves well. The show doesn’t hesitate to explore the differences, and delights in the alien characteristics that humans will not understand, something sometimes minimized in other science-fiction or reserved for ‘special’ episodes. Lest you worry about cred, Penny Johnson Jerald (Star Trek: Deep Space 9, 24) is the wise Dr. Claire Finn, chief medical officer, and producers and directors also carry over from Star Trek. Toss in some stellar guest stars like Jeffrey Tambor and Victor Garber, and this show has unexpected gravitas. It is far more than just a dumb comedy, and while it could not exist in the Star Trek universe, it also wouldn’t fit in the realm of Family Guy or American Dad! either. THE ORVILLE is its own brand. The humor comes in the authentic moments. Crewmen talk to one another the way people do now, not as some high-minded advanced society, but as relatable folks. THE ORVILLE stops short of going full-out MacFarlane, and instead drapes the jokes over a serious plot with actual drama and danger. The humor bolsters, rather than distracts, and I would not classify this anywhere near a strict comedy. And Gordon’s introduction is one of the funniest bits. THE ORVILLE is imaginative, clever, and darn fun to watch. I went straight into the second episode, and will definitely be tuning in weekly. This show, at least in the first two hours, deftly sticks a complicated landing. THE ORVILLE premieres September 10th on FOX.